Taunton, 72 @ Attleboro, 82 – Final – Taunton used a 13-0 run over the end of the third and the beginning of the fourth to cut the deficit to two (59-57) but Attleboro had a response of its own, rattling off a 15-4 run to secure the win. Andrew Milliken hit a pair of threes, Jake Dunkley added four points, Elvin Sam drained a three and freshman Qualeem Charles converted a putback to put Attleboro up 74-63 with just two minutes to go. Dunkley finished with a team-high 21 points, Sam added a career-high 14 points, Milliken had 13 points, Nate Douglas chipped in with 11 points and Charles notched a double-double with 10 points and 10 rebounds. Taunton senior Tommy MacLean dropped a game-high 25 points while Malik Charles, Dante Law and Lens Esquil each scored 10 points for the Tigers. Canton, 66 @ Stoughton, 69 – Final – Stoughton junior Cam Andrews hit a deep three pointer with just seven seconds left to lift the Black Knights to a win. Andrews finished with 18 points for Stoughton. Canton sophomore Devin Foster scored a career-high 30 points for the Bulldogs. Foxboro, 40 @ North Attleboro, 45 – Final – Click here for a recap of this game. Franklin, 72 @ King Philip, 59 – Final – Click here for a recap of this game. Oliver Ames, 43 @ Mansfield, 61 – Final – Oliver Ames was able to keep pace with the Hornets for 16 minutes, trailing just 29-26 at halftime but Mansfield created separation in the third quarter and never looked back. The Hornets outscored the visitors 16-7 in the third quarter to take a 45-33 lead going into the final period. Mansfield senior Sam Goldberg scored 17 points and hauled in 12 rebounds while classmate Evan Christo was a perfect 6-6 from the field for 13 points. Phil Vigeant added nine points and Max Boen had seven points and seven rebounds. Nick Welch led OA with 16 points and Dylan Mahoney chipped in with 12 points. Sharon, 78 @ Milford, 65 – Final – After a high scoring first quarter (23-22, Sharon), the Eagles took a seven point advantage (42-35) in the locker room at halftime. Sharon extended its lead to double-digits in the third, eventually taking a 61-50 lead into the final quarter. Milford cut the deficit to five, 65-60, with 4:40 to play but Sharon closed the game with a 13-5 run. Senior Ricardo Ripley connected on a three in the run, Tommy Modelevsky came up with a timely steal and Sharon was efficient at the free throw line down the stretch. Ripley finished with a team-high 20 points, junior Malik Lorquet had 17 points and 15 rebounds and sophomore Alex Kaufmann chipped in with 15 points. 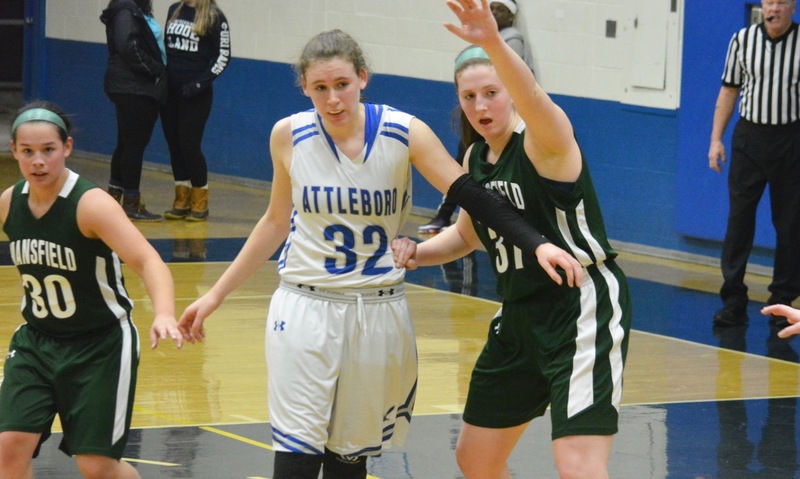 Attleboro, 71 @ Taunton, 44 – Final – Jordyn Lako scored a career-high 24 points for the Bombardiers. Stoughton, 74 @ Canton, 62 – Final (OT) – Freshman Shyanne Trinh scored 22 of her career-high 32 points in the second half and overtime to lead the Black Knights. Senior Lili Njiem added 14 points, Val Whalen added 12 points, and freshman Aliyah Wright chipped in with 10 points. Junior Jordan Motley added 13 rebounds and seven blocks. Canton’s Emma Murphy and Jess Powers each had 12 points. North Attleboro, 39 @ Foxboro, 65 – Final – Click here for a recap of this game. King Philip, 52 @ Franklin, 58 – Final – Franklin rallied from 10 points down to start the fourth quarter with a 27-11 run to close out the game. Ali Brigham led the way for the Panthers with 17 points to help Franklin move within one game of tournament qualification. Shannon O’Connor was the top scorer for KP with 14 points. 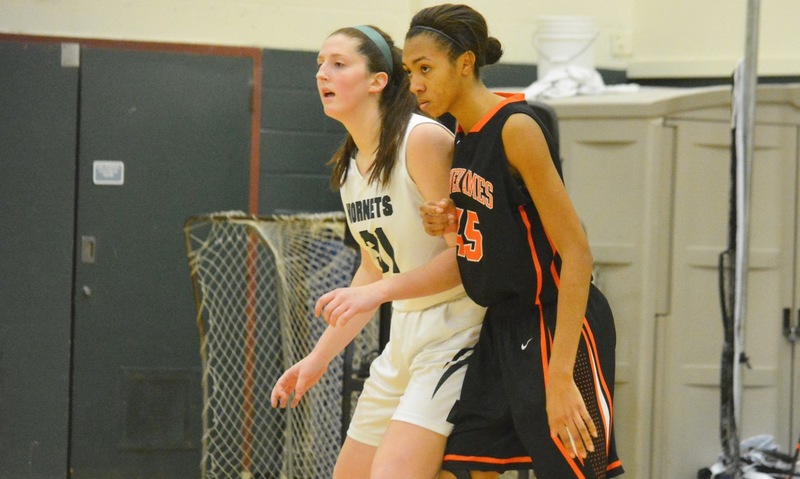 Mansfield, 61 @ Oliver Ames, 49 – Final –The Hornets scored 40 points in the second half to close out the league campaign with a win. Jen Peel paced Mansfield with 17 points, while Meg Hill chipped in with eight points in the second half and pulled down 11 rebounds. Brenna Burkett was OA’s top scorer with 10 points and Niyera Mitchell had nine. Milford, 38 @ Sharon, 41 – Final – Emma Eberhardt scored a team-high 15 points and added five steal and three blocks for the Eagles. She also went 3-of-4 from the line in the final 30 seconds to seal the win. Shira Stoller had 12 points and 10 rebounds in the win. Today’s games are listed below. We will update this post with any changes based on the information we receive. Attleboro, 67 @ Oliver Ames, 61 – Final – Oliver Ames made a push in the second half with 24 points in the third quarter, and took a 53-46 lead, but the Bombardiers battled back to get the win an earn a postseason berth. Nate Douglas scored a career-high 16 points while Jake Dunkley also added 16 points for the Bombardiers. Lucas Boucicaut added 13 points in the win. Oliver Ames senior Nick Welch had a game-high 20 points while Jack Spillane and Carter Evin each had 13 points and Dylan Mahoney added 11 points. Milford, 48 @ Foxboro, 55 – Final – Milford took an 11-10 lead after the first quarter but it Foxboro seized control in the second quarter and never looked back. The Warriors took a 29-25 lead by halftime but then relied on a late surge in the third quarter to create separation. Andrew Block dropped a career-high 20 points, including two threes late in the third. Mark Clagg also hit a three in the third to help the Warriors get the separation. Joe Morrison added 12 points and Jamaine Few chipped in with 11 points. Milford’s Anthony Arcudi had a team-high 17 points while Zack Tamagni and Kayden Kelley each had 10 points. Mansfield, 60 @ Franklin, 43 – Final – Click here for a recap of the game. King Philip, 63 @ Taunton, 64 – Final – Taunton freshman Dante Law hit a three pointer at the buzzer to lift the Tigers over the Warriors. Law (18 points) took a pass from sophomore Luis Vendrell (13 points), who drove the lane before kicking it out to Law. Vendrell had the tying bucket for the Tigers, converting an outlet pass from Tommy MacLean (12 points) to knot the game with 12 seconds to play. KP’s Seth Sullivan scored a pair of free throws to put the Warriors ahead but Law’s buzzer beater. North Attleboro, 66 @ Stoughton, 56 – Final – North Attleboro had its two leading scorers come alive in the final quarter. Brent Doherty (six rebounds) scored 11 of his 21 points and Jonny Friberg (10 rebounds) netted eight of his 21 points in the fourth quarter as the Rocketeers qualified for the postseason for the first time since 2011. North Attleboro took a 43-42 lead into the final quarter but outscored the Black Knights 23-14 in the frame. Senior Kyle McCarthy (10 rebounds) helped carry Big Red in the middle quarters, totaling 10 of his 12 points between the second and third quarters. Stoughton’s Cam Gomes had a team-high 17 points while Matt Valle added 14 points and Ryan Sullivan finished with 10 points. Oliver Ames, 55 @ Attleboro, 50 – Final – Oliver Ames junior Kayla Raymond scored 20 of her career-high 31 points in the second half to lead the Tigers to a season sweep of the Bombardiers. Oliver Ames held a 25-19 advantage at half but Attleboro took a slim lead early in the fourth quarter. But Oliver Ames was able to battle back to earn the win. Raymond also had 10 rebounds while Hannah Carroll added 12 points and Niyera Mitchell registered 12 rebounds. “It was a great defensive effort,” said OA head coach Laney Clement-Holbrook. Foxboro, 54 @ Milford, 33 – Final – Ashley Sampson led the way for the Warriors with 19 points and Lily Sykes added 12 for Foxboro, which remained in a first place tie with North Attleboro. Franklin, 37 @ Mansfield, 59 – Final – The Hornets sealed the outright Kelley-Rex division title with the victory. It is the third league title in program history and first time that the Hornets have won back-to-back championships. Meg Hill scored 24 points and grabbed 12 rebounds for Mansfield, while Jen Peel scored 18 points and had six assists and Ann Maher scored 11 points. Franklin was led by freshman Ali Brigham’s 11 points and also got nine points from senior Carli Koffinke. Taunton, 30 @ King Philip, 54 – Final – KP was led by sophomore Julia Leroux, who finished with 18 points, and classmate Shannon O’Connor, who tallied 11 points. Jess Regan was the top scorer for the Tigers with nine points. Stoughton, 25 @ North Attleboro, 48 – Final – Caroline Collard had 13 points to lead the Rocketeers, who stay in a first place tie with Foxboro with the win. Val Whalen was the top scorer for Stoughton with 11 points. Attleboro @ State Championships (@ Newton North) – Attleboro placed fifth overall with a score of 142.95. Mansfield, 66 @ Attleboro, 56 – Final – Mansfield erased a four point deficit in the fourth quarter, closing the game with a 14-0 run to earn the win on the road. Mansfield senior Benjamin Albanese connected on a trio of three pointers and finished with a career-high 13 points to help the Hornets. Christian Weber hit four three-pointers for a team-high 18 points while Sam Goldberg had 16 points, eight rebounds and six assists. Attleboro freshman Bryant Ciccio scored 14 points while senior Jake Dunkley netted 11 points. Milford, 36 @ Canton, 46 – Final – Canton used a 20-point second quarter to build a 31-15 lead at halftime and then held the Scarlet Hawks to just six points in the final quarter to earn the win. “It’s nice to see focus and execution,” said Canton head coach Ryan Gordy. “We had a game plan coming in and what we practiced carried over into the game. When we are focused we can be a dangerous team. Milford is explosive so we new we had to defend for four quarters.” Junior Tony Harris led the Bulldogs with 16 points and 11 rebounds while classmate Jake Verille added 13 points for Canton. Stoughton, 47 @ Foxboro, 62 – Final – Foxboro built a 10-point lead in the first quarter and held onto that lead the rest of the way. The Warriors went up 22-12 at the first and 35-22 at halftime. Foxboro used a 7-0 run to begin the fourth quarter to put the game away. Senior Jamaine Few tied a career-high with 17 points while Joe Morrison added 16 points and freshman Brandon Borde chipped in with nine points. Stoughton senior Cam Gomes had a team-high 11 points. Taunton, 36 @ Franklin, 78 – Final – Click here for a recap of this game. King Philip, 52 @ Oliver Ames, 63 – Final – Oliver Ames moved within a win of qualifying for the state tournament with a win over King Philip. Senior Nick Welch scored a team-high 19 points while junior Jack Spillane chipped in with 13 points for the Tigers. Attleboro, 47 @ Mansfield, 54 – Final – Click here for a recap from this game. Foxboro, 65 @ Stoughton, 49 – Final – Kristen Bortolotti scored 19 points to lead the Warriors, who moved a half-game in front of idle North Attleboro at the top of the Davenport division. Grace Tamulionis added 14 points and Ashley Sampson had 12 for Foxboro. Franklin, 49 @ Taunton, 29 – Final – Bea Bondhus had a team-high 14 points for Franklin and freshman Ali Brigham added 11 as the Panthers made it three straight wins and seven wins in the last nine games. Oliver Ames, 51 @ King Philip, 35 – Final – Oliver Ames limited the Warriors to just 12 points at halftime, rolling to a 51-35 win on the road. Kayla Raymond dropped a team-high 19 points for the Tigers while Niyera Mitchell chipped in with 10 points. North Attleboro, 3 @ Oliver Ames, 1 – Final – Connor Ford put North Attleboro up 1-0 in the first period and Erik Clements scored his first goal of the game early in the third period to give the Rocketeers a 2-0 lead. Oliver Ames’ Eric LeBlanc cut the deficit in half midway through the final period and the Tigers had a couple of chances to tie the game with the goalie pulled, but Clements got his second of the game with an empty netter to ice the game. OA freshman goalie Owen Connor made 27 saves in his first start. FOXBORO, Mass. – Oliver Ames was starting to click and had scored seven straight points to cut the Foxboro lead from 11 points down to four in the closing minutes of the third quarter. The Tigers grabbed a rebound and had a chance to make it a one-possession game, but a turnover led to an and-one and on the next possession the ball swung from Lauren Flahive out to junior Lily Sykes, who drilled the fourth of her five threes on the night to push the lead back to 10 heading into the fourth. Sykes finished with a game-high 19 points and hit half of Foxboro’s 10 three-pointers, as the Warriors pulled away in the fourth for a 51-35 victory over OA that moves the hosts within a game of division-leading North Attleboro. While OA did not struggle offensively to the same level as last week’s loss to Mansfield (the Tigers scored more in the first half on Thursday then they did in the entire game against the Hornets), the Foxboro full-court press and aggressive half-court defense had the Tigers off-balance. Kayla Raymond (11 points, six rebounds) started the game with a three and Hannah Carroll knocked one down for a 6-3 lead, but the Warriors went on an 8-0 run to a lead they would never relinquish. Kristen Bortolotti (nine points) buried one of her three shots from beyond the arc to tie it, Sampson fed Sykes for her second from outside, and then Sampson (13 points, 10 rebounds) scored off a steal. Niyera Mitchell hit a jumper and Raymond scored on a rebound putback to cut the lead to four after one, but again Foxboro put together a 10-0 run to break the game open. Sykes knocked down another three, scored on a reverse, and Bortolotti buried a three off a feed from Grace Tamulionis. Meanwhile, the OA offense was stagnating. Sadie Homer (seven points) hit a three and Raymond got out on the break for a layup to get back into the game but the Tigers struggled to find consistent looks. Riley Collins closed out the half with a corner three to put the Warriors ahead 27-18 at halftime. The Warriors are regularly out-rebounded and the Tigers had a significant edge in size, but Foxboro was holding its own on the boards and at times dominating the glass. Flahive came off the bench and grabbed eight boards, Tamulionis and Sykes each snagged six, and Sampson grabbed 10. Bortolotti started the second half with another three and Collins answered an Abby Reardon jumper with an offensive rebound basket. Trailing by 11 the Tigers finally started to click. Mitchell kicked out a pass to Carroll (six points) for a three and then fed Brenna Burkett for a layup before snatching an offensive rebound and going up strong for a basket. Just when it seemed like the game might be turning towards OA, a turnover handed the ball to Sampson for a layup plus the foul. Foxboro then broke quickly off a rebound and the ball was kicked out to Sykes, who stole any momentum that the Tigers may have built with another long-range shot. Downs was proud of her team for withstanding the run and turning it back around. She said, “They righted the ship without me having to call a timeout. They were able to settle themselves down on the court, which is something we didn’t do against North Attleboro (in a 53-47 loss). Foxboro extended the run to 13-0 with the first seven points of the fourth quarter to effectively put the game away. Sykes scored five more in the run, picking up the scoring for Sampson who was being pressured by Homer. Foxboro (8-2, 7-2) will play at the Dunkin’ Donuts Center in Providence on Sunday against Milford, while Oliver Ames (8-4, 7-3), which is now 1-1/2 games behind Mansfield in the Kelley-Rex, will be off until Tuesday against Canton. Attleboro, 55 @ North Attleboro, 62 – Final – Click here for a recap from this game. Franklin, 42 @ Canton, 46 – Final – Canton held Franklin to its lowest scoring output of the season, limiting the Panthers to 30 points to three quarters. The Bulldogs trailed 30-26 heading into the final frame before winning the fourth 20-12. It marks Canton’s first win over Franklin in over a decade. “Beating a team like Franklin is a tall order,” Canton head coach Ryan Gordy said. “We needed to execute and play with mental toughness every possession. We grew up as a team tonight.” Canton junior Tony Harris scored a game-high 15 points and hauled in six rebounds while sophomore Devin Foster had 12 points and four rebounds. Taunton, 73 @ Foxboro, 72 – Final (OT) – Taunton freshman Dante Law connected on six three pointers on his way to a career-high 21 points to help the Tigers edge Foxboro in overtime. Senior Tommy MacLean added 15 points for Taunton, who improves to 10-4. Foxboro junior Joe Morrison dropped a career-high 23 points while Jamaine Few added 15 points and Mark Clagg finished with 13 points. King Philip, 62 @ Stoughton, 51 – Final – Click here for a recap of this game. Mansfield, 67 @ Sharon, 52 – Final – Mansfield junior Tyler Boulter broke a school record, connecting on 10 three pointers to net a career-high 30 points in the win over Sharon. Boulter, who scored 15 points in the first quarter, broke the record previously held by Brian Hershman (2011 vs. Stoughton) and David Borkowski (2009 vs. Franklin). Sam Goldberg added 10 points and eight rebounds while Ricardo Ripley led Sharon with 14 points. Oliver Ames, 61 @ Milford, 56 – Final – Oliver Ames erased an early five point deficit to take a 18-12 lead after one quarter and never looked back to pick up the win on the road. Milford cut the deficit to five at half (31-26) but Oliver Ames won the third quarter 16-10 to build a double-digit lead. OA’s Jack Spillane led all scorers with 21 points while Carter Evin added 18 points and Nick Welch finished with 14 points. Zack Tamagni led Milford with 18 points while sophomore Brendan White dropped a career-high 14 points. Attleboro, 56 @ North Attleboro, 19 – Final – Click here for a recap from this game. Canton, 30 @ Franklin, 54 – Final – Franklin had three players reach double figures in a double-digit win over visiting Canton. Carli Koffinke led all scorers with a game-high 16 points while Ali Brigham and Bea Bondhus each chipped in with 10 points in the win. Canton sophomore Julia Hamilton scored a team-high 11 points for the Bulldogs. 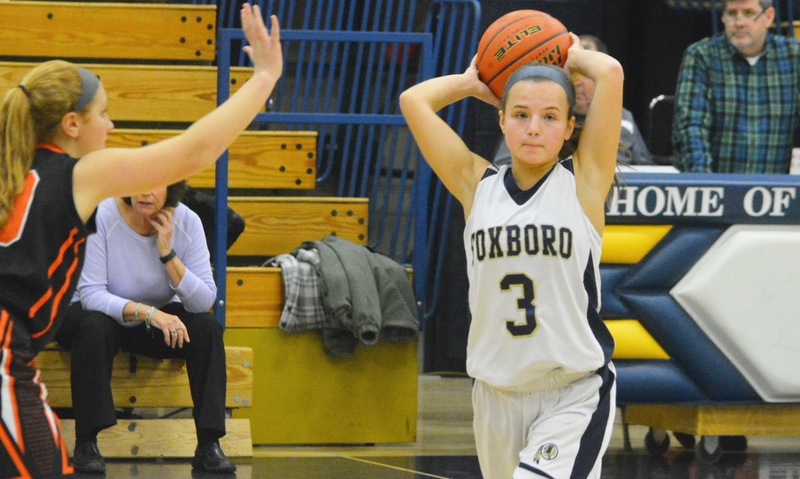 Foxboro, 56 @ Taunton, 33 – Final – Foxboro junior Ashley Sampson led the way for the Warriors with a team-high 17 points while classmate Grace Tamulionis added 16 points in the win on the road. Stoughton, 59 @ King Philip, 54 – Final (OT) – Stoughton ramped up its defensive effort in overtime to pick up the win on the road. Stoughton junior Val Whalen had another monster night for the Black Knights, notching her fifth double-double of the season with 21 points and 21 rebounds. Freshman Shyanne Trinh added 14 points for the Knights. Sophomore Julia Leroux scored a team-high 20 points to pace King Philip. Sharon, 18 @ Mansfield, 65 – Final – For the second straight game, the Hornets held their opponent to under 20 points to earn a win at home. Offensively, the Hornets had a very efficient showing with junior Ann Maher going a perfect 8/8 from three point range in the first half – a school record – and junior Meg Hill scoring 14 points on 7/9 shooting. Milford, 42 @ Oliver Ames, 58 – Final – Oliver Ames built a double-digit lead (30-18) by halftime and held onto it throughout the second half. OA junior Kayla Raymond had a game-high 24 points and hauled in 12 rebounds while Niyera Mitchell had 13 points and 12 rebounds for the Tigers. Stoughton, 3 @ Bellingham, 9 – Final – Stoughton’s Charlie Morgan and Ryan Buresh each scored their first varsity goal in the loss, while Brendan Campbell scored the other goal for the Black Knights. Foxboro, 65 @ Attleboro, 90 – Final – Foxboro took first in the 50 free and the 400 free relay but fell to Attleboro. Foxboro’s Dan Egan took first in the 50 free (25:31) while the team of Dimitri Davis, Anthony Quarterone, Ben Dorman and Thomas VanDell took first in the 400 free relay (5:12.30). Foxboro, 72 @ Attleboro, 92 – Final – Foxboro had three first place finishes, including one relay team. Lexi Nelson was first in the 100 fly (1:06.47), Lindsey Nelson was first in the 100 breaststroke (1:05.09) and the team of Nelson, Nelson, Allison Curran and Jamie Gorham took first in the 200 medley (2:13.84). After more than 40 years at the helm of the Tigers, a career that has encompassed more than 650 wins, Clement-Holbrook admitted that she had never had a team go without a made field goal for an entire half. That was, at least, until Friday night at the Albertini Gym against division leading Mansfield. Although the Tigers had historic struggles on the offensive end, Mansfield was hardly firing on all cylinders. The Hornets reached double-digits in a quarter just once, scored only four points in the fourth quarter and shot 4-16 from the free throw line (all in the first half). However, it was enough for Mansfield to pull out a 32-17 victory and take control of its own destiny in the race for the league title. Mansfield started the game by going inside to 6-foot-3 junior center Meg Hill (18 points, 17 rebounds). Jen Peel (five points, five assists) flipped a pass to Hill for a layup and sophomore Maggie Danehy got Hill a good look with a pass to the left block. Hill added a couple of free throws, but the Hornets had a long stretch without scoring until Ann Maher knocked down a three off a Steph Kemp assist. That bucket gave Mansfield a 9-0 lead heading to the second. Mady Bendanillo set up Hill for a fast break basket to start the quarter and OA finally got on the board with a pair of free throws by Abby Reardon (team-high six points, all from the line) with 5:39 left in the half. The Tigers would get only one more point before the break, while the Hornets shot 2-14 from the line in the second and needed a scoring burst at the end of the second, including three points from Erin Daniel and a drive from Peel to get separation. The Hornets talked about the free throws at halftime and how OA was one good run from getting back into the game. Mansfield started the third quarter strongly and again it was Hill that the offense ran through. Hill scored six of the first eight points of the third and Peel buried a three to extend the lead to 19. Niyera Mitchell knocked down a jumper for the Tigers’ first made field goal and she assisted on a basket for Kayla Raymond (five points, 10 rebounds). Hannah Carroll knocked down a three for her only points of the night that cut the lead to as little as 13 at 30-17 in the fourth quarter. “I think if we had played the first half like we played the second half, I think we probably would have been a lot closer,” admitted Clement-Holbrook. Redding called timeout knowing that his team needed a basket and Peel was able to flick a no-look pass over the defense to Hill for another layup. It was the final point for either team. Mansfield has now beaten title rivals Attleboro and OA in the past two weeks and has a one-game lead over both. Defense has been the calling card for the Hornets, who have held four of the top six scorers in the league (Ashley Sampson, Sarah Deyo, Julia Strachan, and Raymond) well below their season averages and are allowing a league-best 37.0 points per game. “We’re doing what it takes to win tough games and we’ll take it at this point,” said Redding. Clement-Holbrook is hoping for a response from the Tigers in their next game. She said, “They’ve got to be able to rise above this now and come back on Tuesday and be ready to roll. Mansfield (9-2, 7-1) will host Sharon on Tuesday, while Oliver Ames (7-3, 6-2) will host Milford. Oliver Ames, 62 @ Attleboro, 49 – Final – Oliver Ames built a 10 point lead by halftime and extended its lead to 17 in the third quarter to earn the road win. Attleboro battled back to cut the deficit to eight (48-40) entering the fourth quarter but Oliver Ames closed out the game with a 14-9 final quarter. Nick Welch scored a career-high 25 points to lead the Tigers while Jack Spillane added 15 points for OA. Sharon, 49 @ Canton, 63 – Final – The Bulldogs turn a close game at halftime (29-22) and built a 20-point lead in the third quarter. Sharon was able to cut it to 12 (46-34) entering the fourth quarter but Canton’s offense didn’t slow down with 19 points in the final quarter. Sophomore Devin Foster led the Bulldogs with a team-high 19 points while junior Austin Maffie netted 17 points and hauled in 7 rebounds. Sharon’s Malik Lorquet had 17 points and eight rebounds while Ricardo Ripley added 15 points and three steals. Foxboro, 52 @ Milford, 65 – Final – Milford turned a one-point deficit at halftime into a lead behind 25 points in the third quarter. Foxboro got within six at just under six to play but couldn’t close the gap. Shane Cosquete scored a career-high 19 points to lead the Scarlet Hawks while Zack Tamagni added 18 points and Kayden Kelley had 14 points and 12 rebounds. Franklin, 52 @ Mansfield, 40 – Final – Click here for a recap of this game. Stoughton, 54 @ North Attleboro, 68 – Final – North Attleboro was able to break the press and race out to a 22-6 lead through the first eight minutes. Stoughton’s Cam Andrews scored 12 of his game-high 21 points in the second quarter to get the Black Knights within 10 (32-22) at the break. Both offenses poured it on in the third quarter, totaling 55 points between the two teams. North Attleboro’s Chad Peterson scored eight of his 16 points in the final quarter, including a pair of key three pointers to help the Rocketeers ice the game. Jonny Friberg had a team-high 17 points for North while Brent Doherty added 13 points. The Rocketeers went 20/24 from the free throw line in the win. Attleboro, 48 @ Oliver Ames, 60 – Final – Oliver Ames used a dominant second half, outscoring the Bombardiers 34-19, to score a key division win over Attleboro. “It was a great defensive effort for us,” OA head coach Laney Clement-Holbrook said. Sadie Homer scored a career high 24 points to lead the Tigers while, Kayla Raymond had 12 points, Niyera Mitchell had eight points, 10 rebounds and five blocks and Abby Reardon chipped in with nine points. Sharon, 54 @ Canton, 60 – Final – Canton used a 23-11 fourth quarter to pull out the victory. Hannah Jerrier scored 20 points (12 in the fourth quarter alone) and pulled down 14 rebounds for the Bulldogs. Emma Murphy chipped in with 11 points and Erin Devine had 10 for Canton. Emma Eberhardt scored 22 points in the loss and the Eagles also got 10 points apiece from Shira Stoller (six assists and seven rebounds) and Veronica and Kaitlyn Wallace. Mansfield, 43 @ Franklin, 50 – Final – Bea Bondhus scored a game-high 13 points for the Panthers, 10 in the second half, to help Franklin hand Mansfield its first league loss of the season. Carli Koffinke scored 12 points and Ali Brigham had 11 for the Panthers. The Hornets were led by Ann Maher’s 12 points, while Maggie Danehy scored nine and Jen Peel added eight (seven in the first quarter). King Philip, 61 @ Taunton, 34 – Final – Sophomores Shannon O’Connor and Julia Leroux each scored 14 points to lead the Warriors and freshman Faith Roy added 10. Hannah Moniz was the top scorer for Taunton with 11 points. North Attleboro, 59 @ Stoughton, 47 – Final – Click here for a recap of this game.